How do you ensure your cat stays happy and stress-free this season? 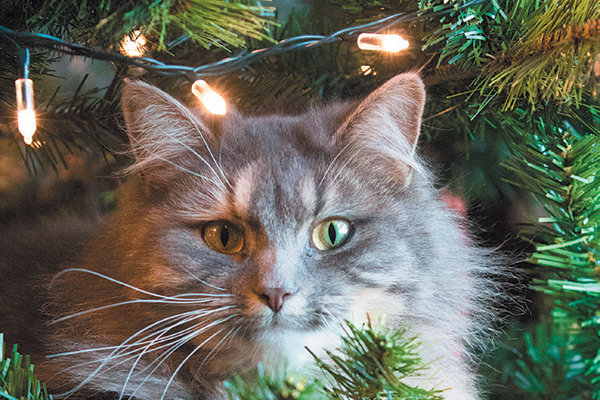 See one vets tips for how to keep a cat active during the holidays. The holidays are here. As we start planning the festivities, let’s not forget about our cats. We like to indulge our cats just as much as we like to indulge — or in some cases overindulge — ourselves this season, but when it comes to our furry friends, it’s important to keep in mind what’s best for their overall health. Here are a few ways to keep your cat active during the holidays. Gift your cat with interactive toys this holiday season — just watch your cats around ribbons and wrapping paper! Photography by Lubava/Shutterstock. Everyone loves receiving gifts — cats included. The question is, what do they love? Not only are cats finicky when it comes to their food, they are also more of a challenge when it comes to finding toys they like. Cats are natural hunters and love to chase moving objects, so finding anything that they can chase will be a treat for them. My cats (and I have quite a few) love chasing a laser light on the floor or a wall (just remember to give them a toy to “kill” at the end of a laser play session!). They also love playing with mouse-shaped toys that house treats inside, making for an entertaining, delicious and active game of cat-and-mouse! Equally as challenging as finding the perfect toy is trying to get your cats to exercise — especially during the busy holiday season. Make exercise fun by providing them with a designated indoor play area, with items to help keep them moving, like a tall scratch post or steps to climb. Encouraging playtime not only keeps your cats occupied while you’re preoccupied with holiday craziness, but keeping our fur-friends moving will get them in tip-top shape all year-round. 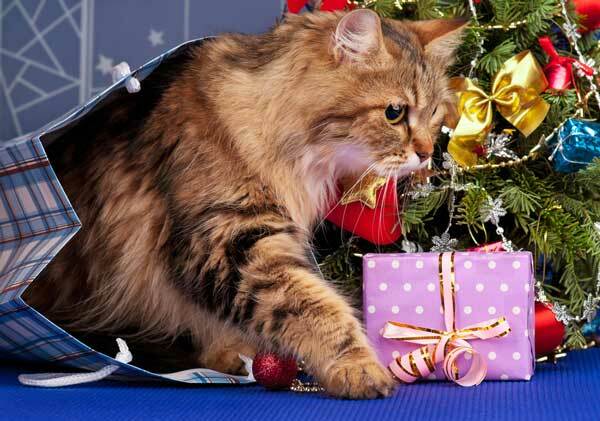 Take some precautions when it comes to holiday items that are not safe for cats. Cats love string, and they’ll go after ribbons, tinsel and cords from holiday decorations. If they ingest any of these items, it can cause severe intestinal damage. Another common danger to cats that not many people think of right away are candles. Cats are intrigued by flickering flames —which they often like to tap. Don’t leave cats unattended near any kind of flame! Fireplaces, too, for that matter. The best way to keep cats from eating what they shouldn’t during the holidays and to help cats stay active during the holidays is to give them a good, healthy diet that they will love. One thing to keep in mind when it comes to cats is that they are obligate carnivores, unlike dogs, which means they need their proteins to come from animal sources. I personally feed my cats Iams High Protein. When looking for the right food for your cat, you should look for one that lists an animal protein source as the main ingredient. Thumbnail: Photography © Kenneth Hunter| Alamy Stock Photo. Tell us: How do you keep your cat active during the holidays?